the three Bs | eat. play. sleep. If ever you are in Portland, and it’s early in the morning on a Sunday, and you’re hung over hungry, make sure to stop by Waffle Window. One of those blink and you miss it/people tell you about it but you can’t even actually seem to find it places. 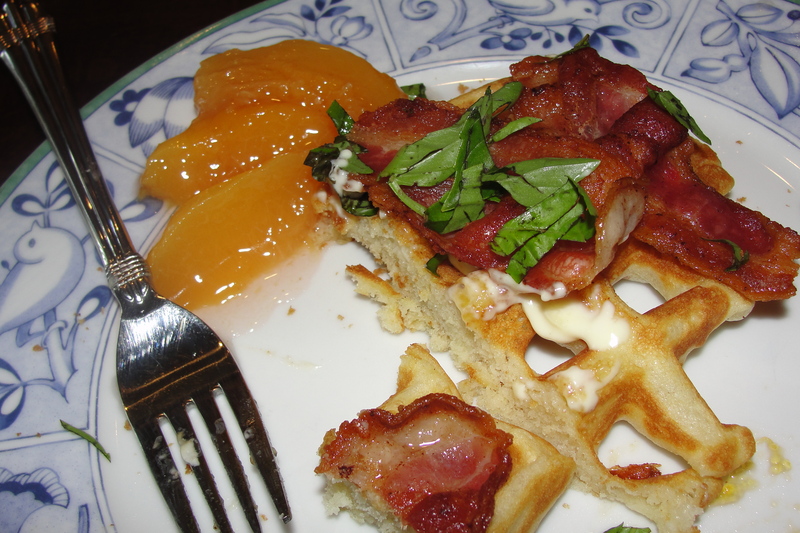 Their basic waffles are really great, but the Three Bs is my personal favorite – bacon, brie, and basil. On a waffle. With a side of peach jam. Really, what’s not to love? Since moving to jet city, I’ve really been missing my 3 Bs. Luckily, I happen to have a husband who makes some insanely good waffles (using this recipe)…and I took care of the rest!